A perennial plant with a woody structure that is exogenous. That is it grows on the outside, a small amount each year. The source of wood. The wood between the heartwood and the bark of a tree. Not as resistant to decay as heartwood. 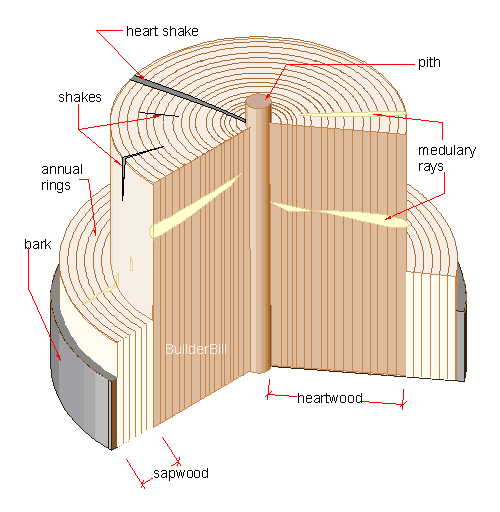 The central core of a log, soft with no strength and seen as a fault in timber. Cells or ribbons of tissue in a tree that extend from the pith to the bark to move food horizontally in the tree. A section through a tree showing some of the terms used. The feature of a tree is that it grows a certain amount each year and that it does this by adding an extra layer to the outside. This exogenous growth provides the tree and the timber or lumber that we get out of it with those growth rings that that give us the grain. The main cells in the tree trunk are aligned vertically but the medullary rays, that range from microscopic and indetectable by eye, to probably 12mm or 1/2" wide . These rays are seen as a decorative feature of a few hardwoods and the one that seems to provide the largest of them all is English Oak. The medullary rays seen clearly on this piece of unfinished English Oak.